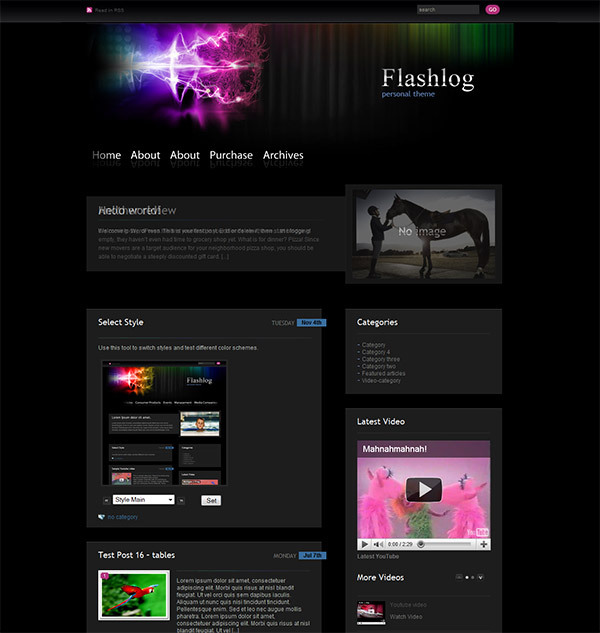 Flashlog is a unique personal page theme, it has a vivid and impressive design, outstanding Flash animation and effects. The design of this theme is going to make your blog stand out. It also features astonishing functionality of additional custom modules, the administration of the theme control panel, and also a fully adjustable sidebar and the footer with the help of widgets. You also get a Flash animated header and menus, you can choose between displaying pages or categories in the menu, you can select between showing full posts or excerpts, as well as 7 custom NattyWP widgets and 2 delicious color scheme. The theme is also ready for localization using gettext functionality (.po files), there are additional page templates for Archives, Sitemap and Fullwidth, it comes with SEO Optimised Layout with custom SEO settings, so you can optimize each post. There is an Automatic Image Resizer, which is used to dynamically create the thumbnails for the blog posts, you can add video to your post from more than twenty video services such as Youtube, Vimeo, etc.